Lindsay Paddon knows what it’s like down at Waituna when the lagoon reaches high levels. The photos below show him firstly in June 1994 with the lagoon at 2.35m. And then in recent times at a low lagoon level (in the same place). 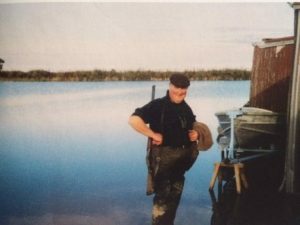 The Invercargill fisherman and hunter is pictured beside his hut near the Moffat Creek – one of the main feeder creeks into Waituna Lagoon. Mr Paddon attended the Whakamana Te Waituna Trust’s drop-in session at Gorge Road Country Club at the end of last week. What was supposed to be an information evening soon turned into a community meeting after farmers arrived en masse and armed with questions about how the Trust was planning to spend money in the catchment. And although the Trust had called the evening a “drop-in” session with the aim of informing farmers – they had very few, if any answers, to the farmers’ questions. 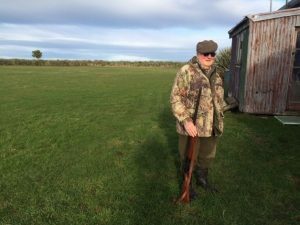 Mr Paddon had asked about rates but was told by one of the farmers present that rates were the least of his worries, as the Trust planned to get rid of his fishing hut, among others. A hot topic was lagoon levels. The Trust representatives were questioned at the meeting on their proposed higher lagoon level. Prior to an OIA request by one of the farmers, talk of raised levels had been kept quiet and farmers were unimpressed about being kept in the dark. At present the lagoon can be opened when it reaches a height of 1.8m or 2.0m depending on conditions and the time of year. Farmers adjacent to the lagoon are particularly concerned about the damage to their farms if the lagoon level is lifted.